When my friend Jodi posted this recipe on her blog, it went straight to the printer in prep for making this chocolate delight for my family. Anyone who has known me for any length of time knows I’m not much of a baker of breads and sweet treats. But give me chocolate and sea salt? I’m game! 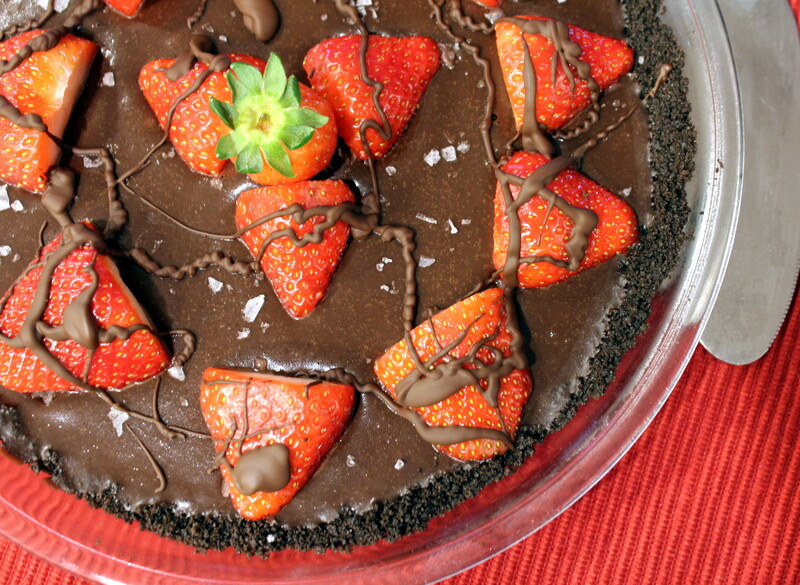 Ooh, and the chocolatey pie crust is made from Oreo cookies. YES. Oreos. Cream filling and all. Shut up, right? 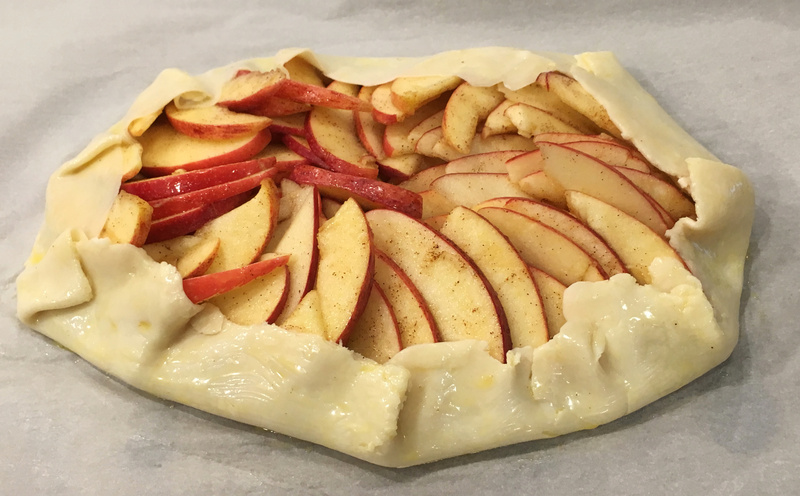 I halved the recipe since I don’t own an 11-inch tart pan that it called for. One that has a bottom that conveniently pops off the bottom no less. I missed this fact in my excitement to make the recipe, and PM’d Jodi asking her how on earth she got the tart out of the pan without destroying it. My tart was served from the dish, to the anxiously waiting mouths of my family and friends. My daughter and her friend dived into it with extra strawberries on top. It may be pretty with the strawberries arranged, but plan on serving extra strawberries with this, yum! Add the Oreo cookies to a food processor (I used my 2-cup Ninja) and process until they are fine crumbs. Pour in the melted butter, and pulse until the butter is combined. 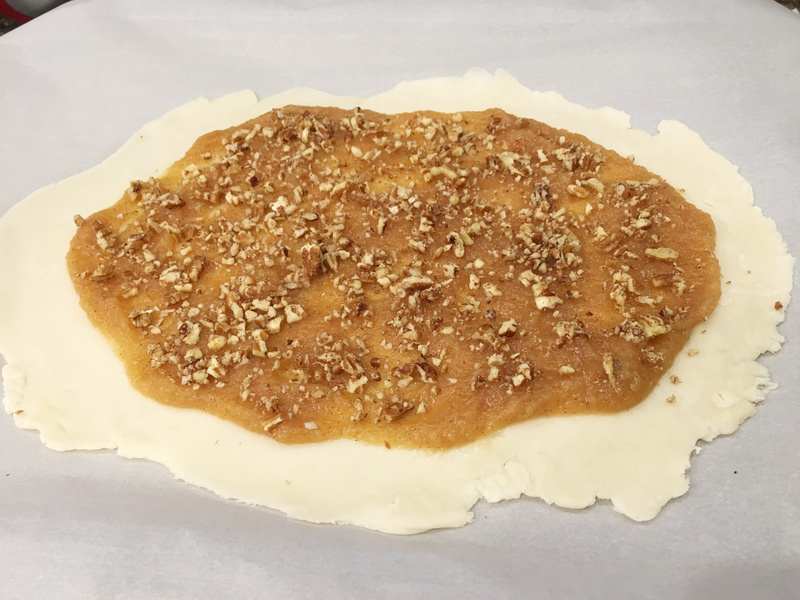 Pour the crumb and butter mixture into a 9-inch (7 ½ at base) tart dish. 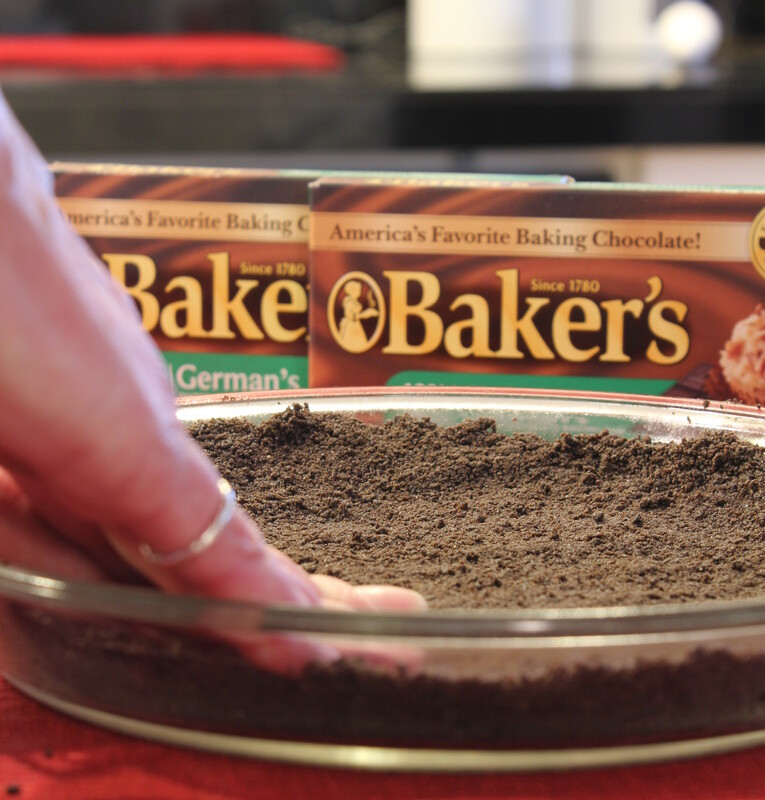 Using your hands, pat the crust onto the bottom and up sides of dish. Refrigerate until for at least one hour before preparing and adding filling. To make filling, break up chocolate and place in a heat-proof bowl. Add the heavy cream to a small sauce pan and bring to a boil. Immediately pour over chocolate. Allow the hot cream to melt the chocolate for a minute or two, then slowly whisk the mixture until smooth and fully incorporated. Pour into the chilled, firm crust. Refrigerate for four to six hours or overnight. 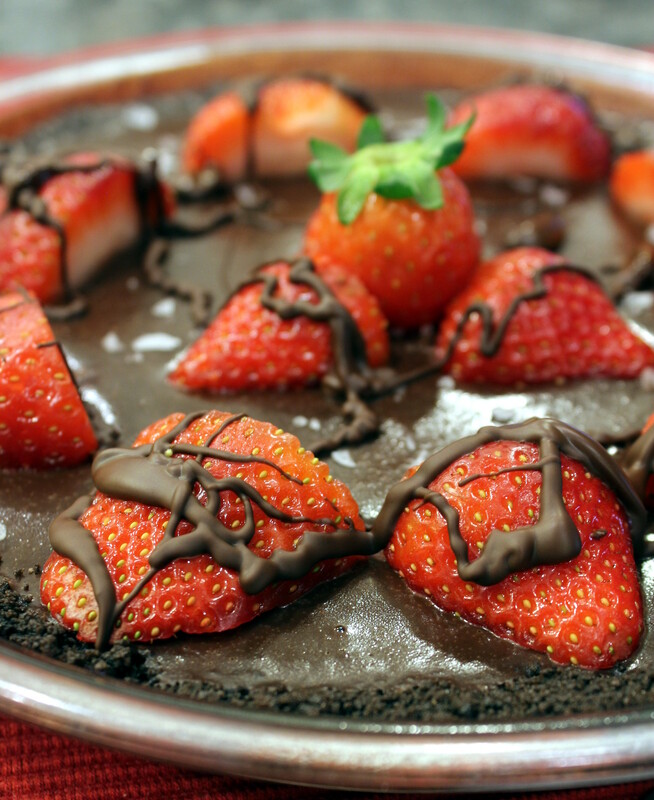 Lightly sprinkle sea salt flakes over the chocolate, then arrange the strawberry halves over top. Drizzle additional melted chocolate over all, if desired. This serves about six. Oh wow, how exciting! I’ve made it to the Community Pick level for the most recent Food52 cooking contest for Your Best Recipe Made with Coffee! This was a tricky category for me as I don’t cook a lot of desserts (as you can probably tell by the amount of recipes available in that category on my blog). This was a great piece of news for the start of a three-day weekend for me! Yay! I’ve never made it to the finals but bragging rights at this level are still OK, right? Once again, a big shout-out to all the wonderful folk who voted my last recipe through to the final round of Diced! This next round had me a bit nervous, as I don’t have much of a sweet tooth and don’t do a lot of dessert dishes. So I had to rely on finding some other recipes that I could cobble together to come up with something “original” that included the three required ingredients: Coffee, Bananas, and Brown Sugar. The voting won’t open for a few days so I’ll post a linky when it does. The day I got the ingredient list, I also got the latest edition of Southern Living in the mail. (Yes, I love my print magazines!) 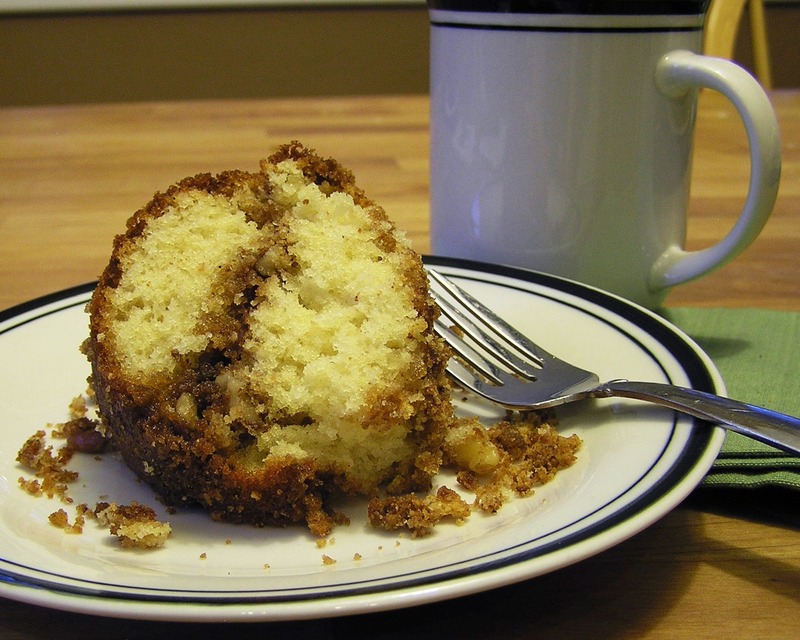 And lo and behold, way in the back of the issue was a coffee-flavored bundt cake called Baba ah Rhum. Bingo! 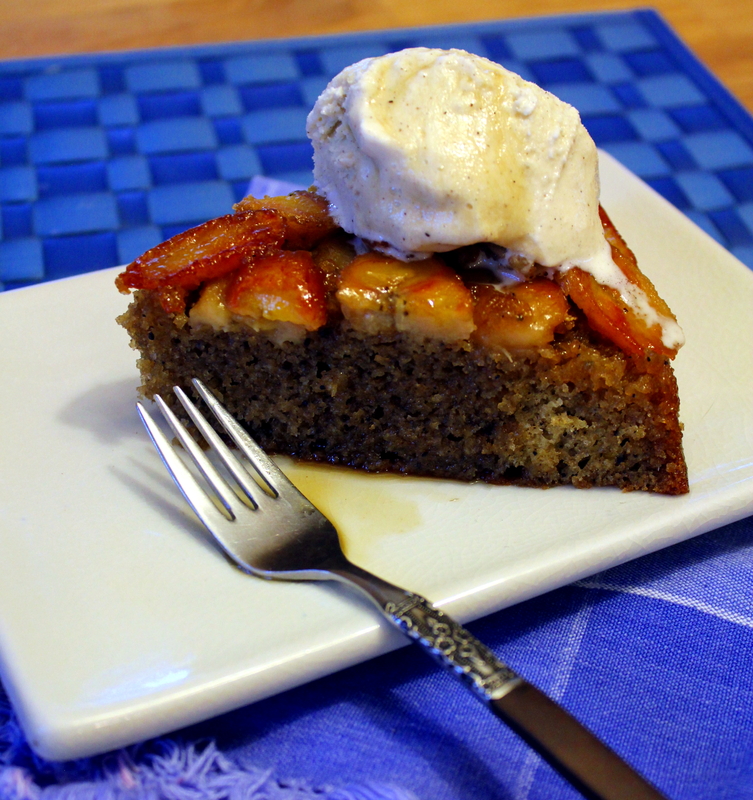 But there were no bananas to be found in that one, so had to go find another recipe that used bananas as a dessert. I ran across an interesting upside-down banana tart on Chow’s website but it used a pastry dough as the crust. I started thinking about how I could combine those two, and settled on scaling down the bundt cake and using the cake instead as the “crust” for the bananas. 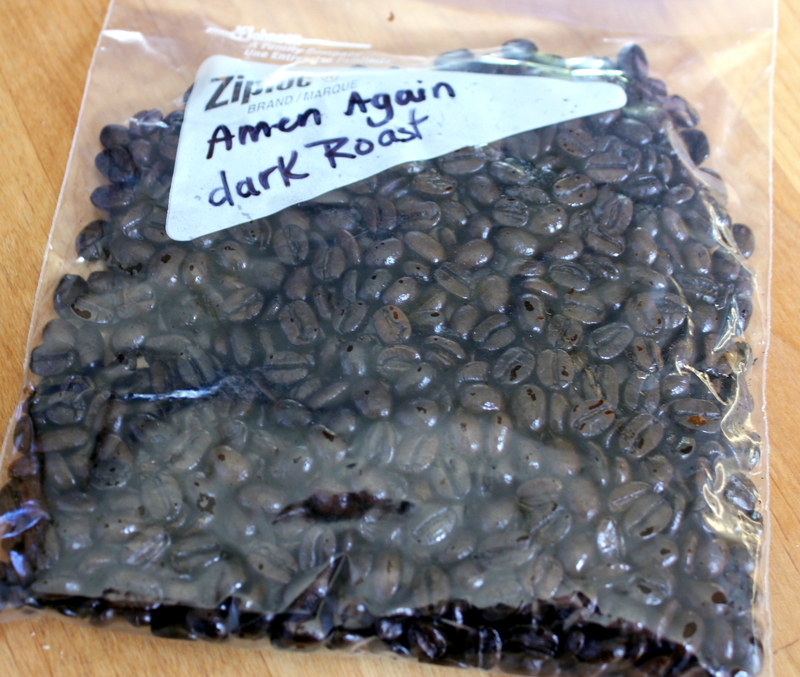 For the coffee, I decided to use a dark roasted coffee called “Amen Again,” which is hand-roasted and delivered to your door by Dan over at Coffee on the Porch website. He makes a lot of great coffees, so stop on by there and check out his selections. Link to Coffee on the Porch here. Although technically Baba au Rhum is made with rum, I had to make this kid-friendly so my daughter could eat it, so left out the alcohol. Either way, leaving it out sure did not make any difference in how delicious this came out! In a deep-sided cast iron skillet, melt the butter over medium high heat, then add the brown sugar, coffee, and cinnamon stick. Stir continuously until it starts to boil, then reduce heat down and simmer for about 15 minutes, stirring occasionally, until thickened. 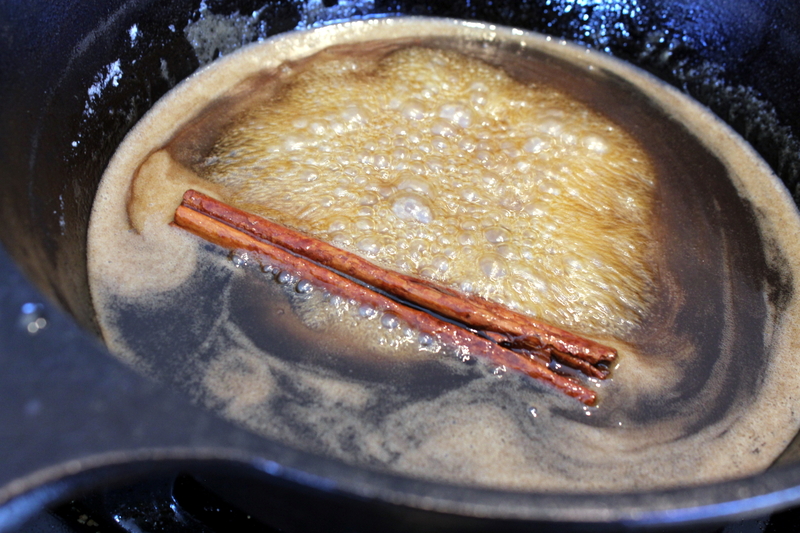 Remove the cinnamon stick and remove from heat. Stir in the vanilla extract. 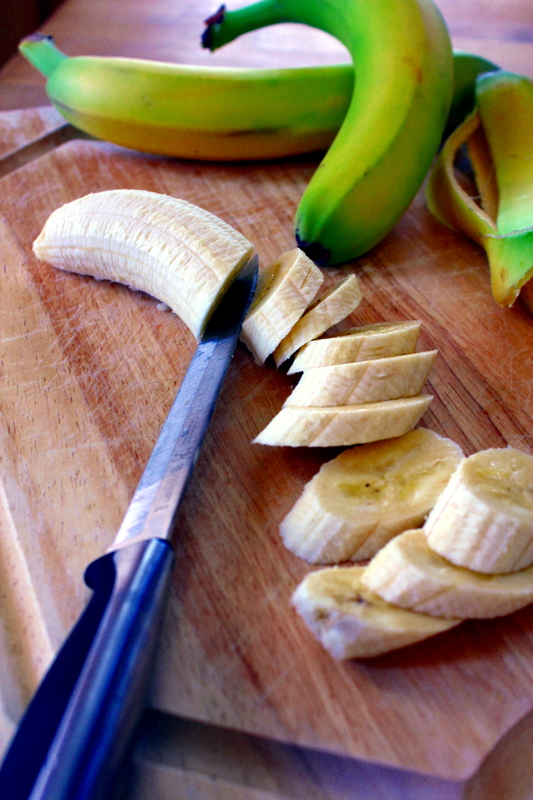 Now slice the bananas on the diagonal, then mix them and the lemon juice gently into the coffee syrup in the skillet. I’m assuming the lemon juice is to keep the bananas from turning brown. I found there was way too much syrup, so I removed about 1/3 cup of it at this point. You can arrange the slices in a pattern in the skillet, but I just pushed them around to cover the bottom of the skillet. Now it is time to make the cake batter. 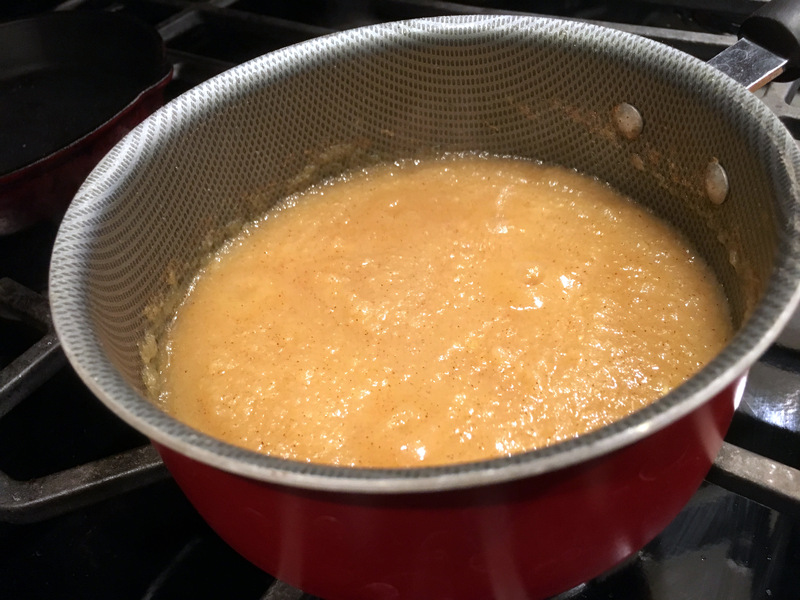 In a large bowl, whisk together the yolks and white sugar until it is thick. In another bowl, sift together the flour, baking powder, ground coffee, and salt. Add it to the yolk mixture until blended. It’s pretty thick at this point but the next step loosens it up. Stir in the melted butter and milk and mix until blended. Using an electric hand mixer, whisk the egg whites in another bowl until stiff peaks form. Fold about one-third of the egg whites into the yolk batter. Gently fold in the rest of the egg whites until combined, but don’t over-mix it. Pour the batter evenly over the bananas and syrup. Place skillet in preheated oven, and bake for about 50 minutes or until toothpick inserted into center comes out clean. Meanwhile, add coffee and brown sugar to a medium saucepan and bring to a boil. Reduce heat to low and simmer for about 15 minutes, stirring occasionally, until slightly thickened. 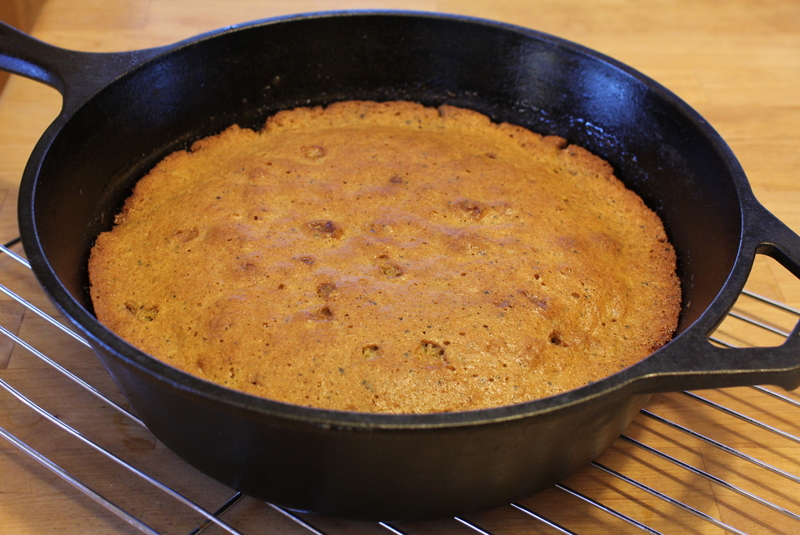 Set aside until cake is done, and reheat slightly just before removing the cake from the oven. WHEW! Not too bad. 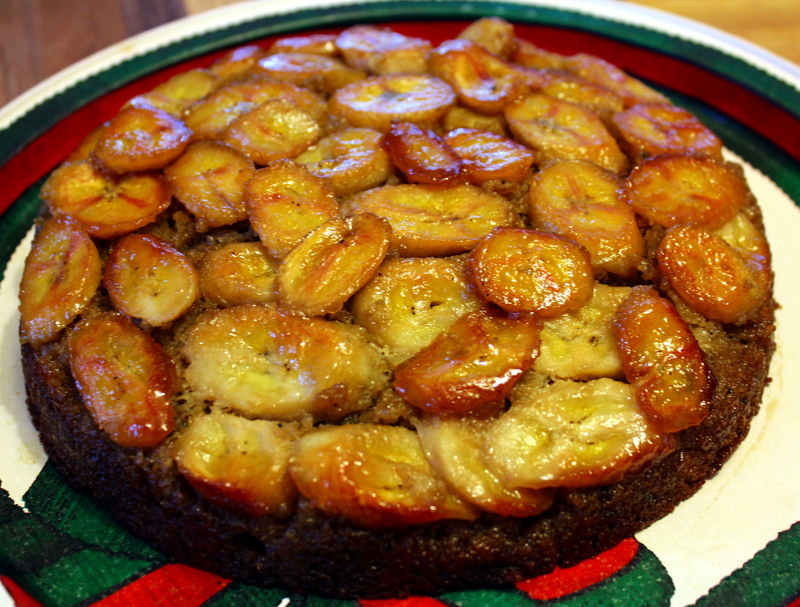 Only a few of the bananas stuck to the skillet, so I simply unstuck them with a fork and replaced them to the top of the cake. Beautiful! 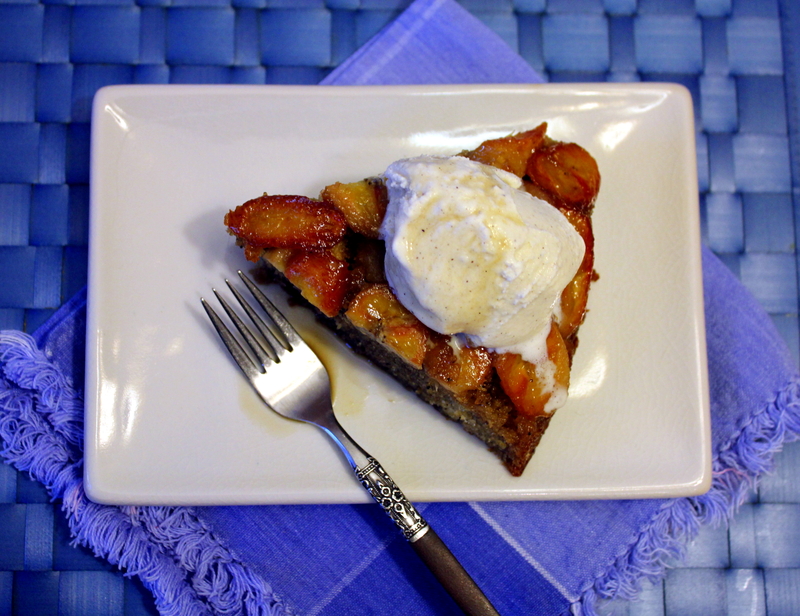 Serve slices of the warm cake with vanilla ice cream, pour some of the extra coffee syrup over it, and dig in! Just heavenly! Starbucks Old Fashioned Coffee Cake ~ Coffee Anyone??? Turns out it was a Pinterest link to all the Starbucks recipes in electronic book form, so I didn’t have to buy it, but there was no option to print it! I know that sounds odd, but even using the web browser print feature didn’t work properly. So I captured a screenshot of one of the recipes she wanted to make and printed it. I’ve typed it out below so that you can copy and paste it to a word editor if you want to print it, or just print this page from your browser. It’s been on my bucket list to get some kind of widget for print-friendly recipes, but alas I have not gotten around to that research. And by the way, the website where I got this from is not the original author. I tried to get to the original source of it, and ended up on all kinds of pfishy and scary pages so I am leaving the link to it off of here in the interest of security. Since I am not the baker in the family (as I’ve told you too many times, right?) we followed this recipe exactly. I am pretty sure you can’t fudge on baking ingredients without something in the process failing. OK, maybe adding more nuts or a different type would work, or subbing raisins or something, but the rest of it is in the “no-touchy-changey” zone for me. I let my daughter make the majority of this, but I did have to supervise and step in periodically. She’s actually coming along quite well with her mixing and measuring techniques. 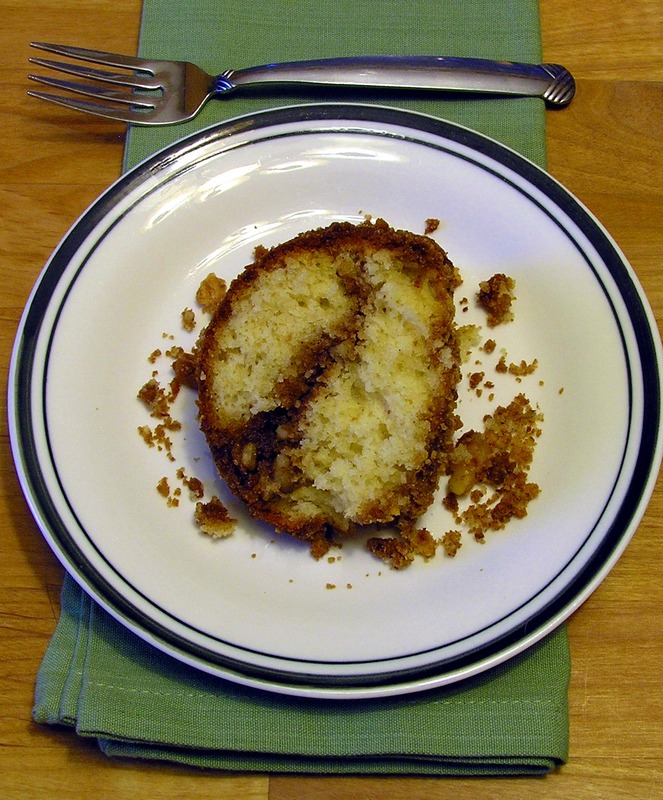 This coffee cake came out just delicious, and having a piece warm out of the oven was divine! It’s not overly sweet, and the house just filled with this lovely aromatic cinnamon and fresh baked bread smell, which lingered for hours and hours afterwards. I am glad we made this. We’ll have a yummy breakfast or afternoon snack for several days now! Moving on, take a much larger bowl, and mix the flour, sugar, and baking powder. Chop up the softened butter into smaller cubes and add to the bowl with the eggs, vanilla extract, and milk. 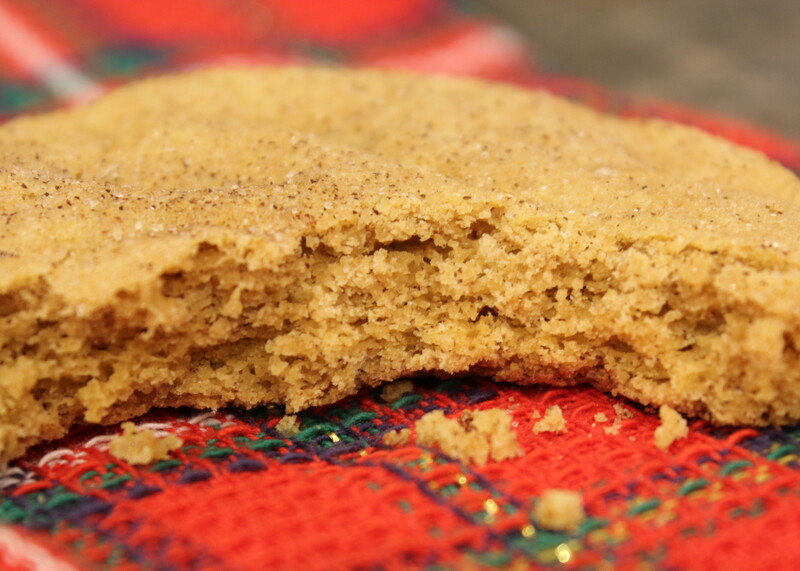 According to the recipe, you should “beat vigorously until smooth and quite thick,” for about one minute. Well we didn’t use an electric mixer because it didn’t say to do that, so we used a fork and took turns until we deemed it vigorously beaten and quite thick, which took longer than one minute. Maybe three or so. Spread half of the batter in the bottom of your pan, then sprinkle half the Struesel mixture evenly over that. Layer the rest of the batter and Struesel again. Bake for 50 minutes, or until a toothpick in the center comes out clean. Cool for a minimum of 20 minutes, then remove from pan and serve. Coffee would be an excellent choice with this. My daughter is really trying to turn me into a baker! My teenage daughter asked if she could make these about a week ago. She showed it to me online, and I said that was fine, so we went and bought the ingredients. 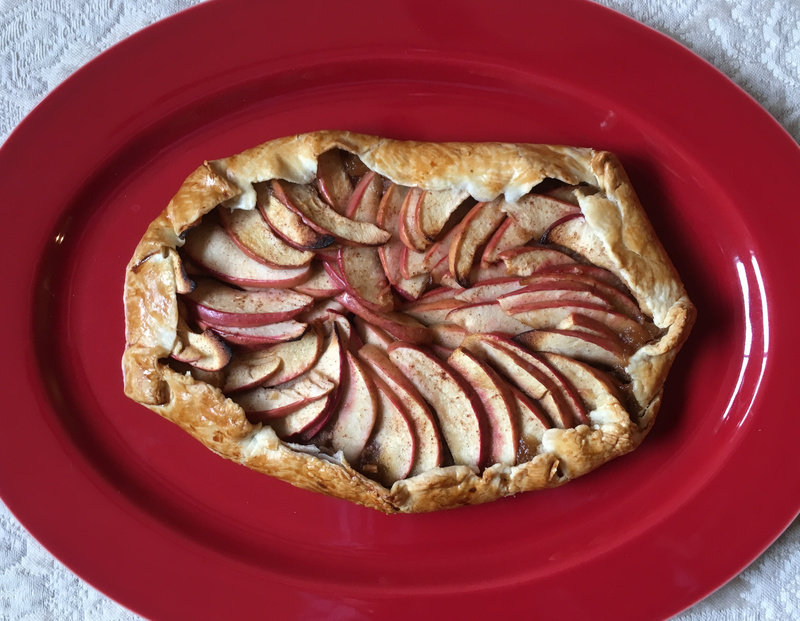 She’s discovered Pinterest, and while most of her browsing is on nail and fashion boards, she does browse the foodie boards here and again and glommed onto this recipe and pinned it. As we started making it for our Sunday dinner dessert, she said, “Mom? 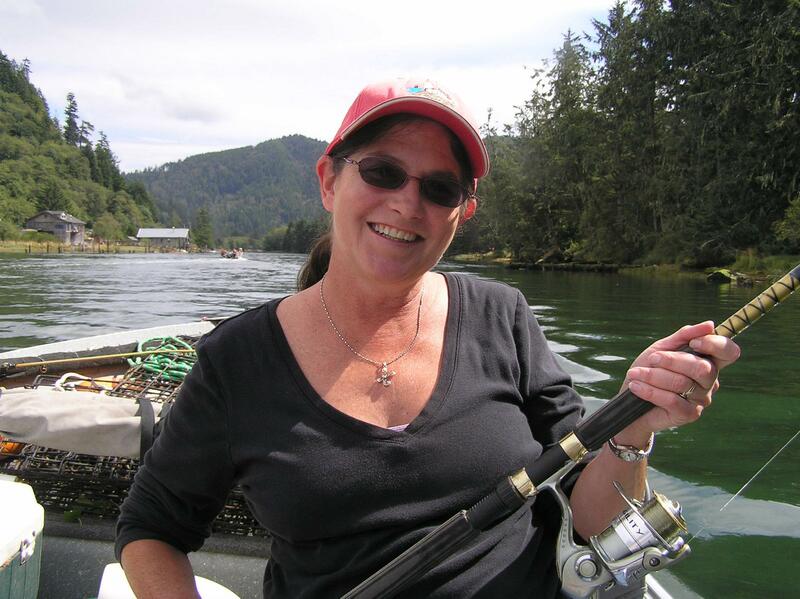 Can you put these on your blog?” Wow, I didn’t think she even read it or had one iota of interest in this site of mine. Now I’ve probably completely embarrassed her by saying all that, but oh well. 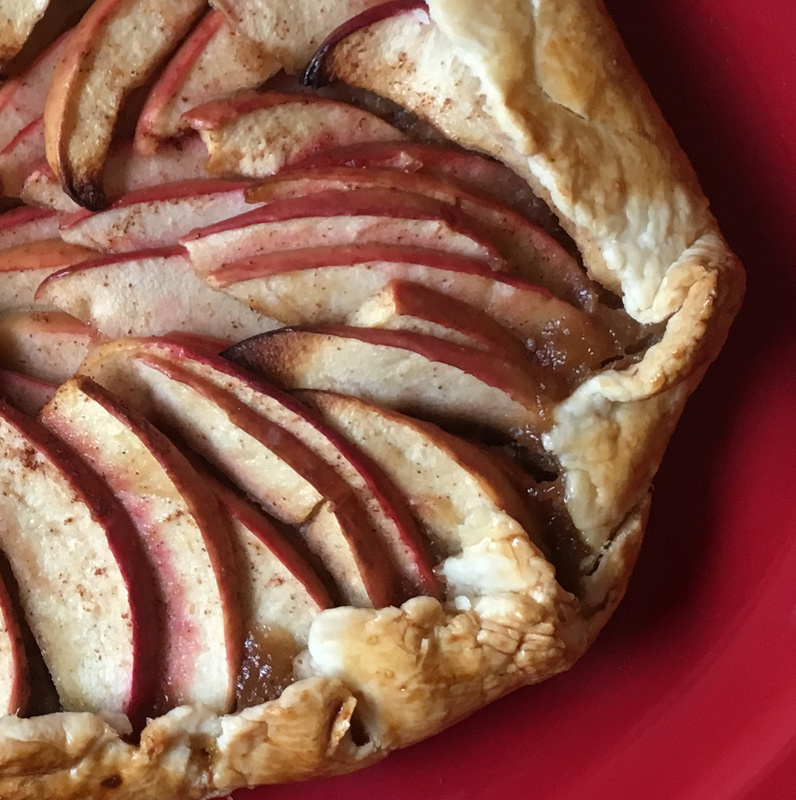 So here you have these incredibly delicious, incredibly oil-splattering messy but oh so good dessert (or breakfast — hey they have apples!) Chimichangas. They really were not that hard to make and the process took probably an hour total if you don’t include the cooling time of the filling. It’s just that when you have an inexperienced cook/fryer who needs assisted a lot, making them does take a while longer. If you know how to roll up a burrito and fry food, then you’re good to go. 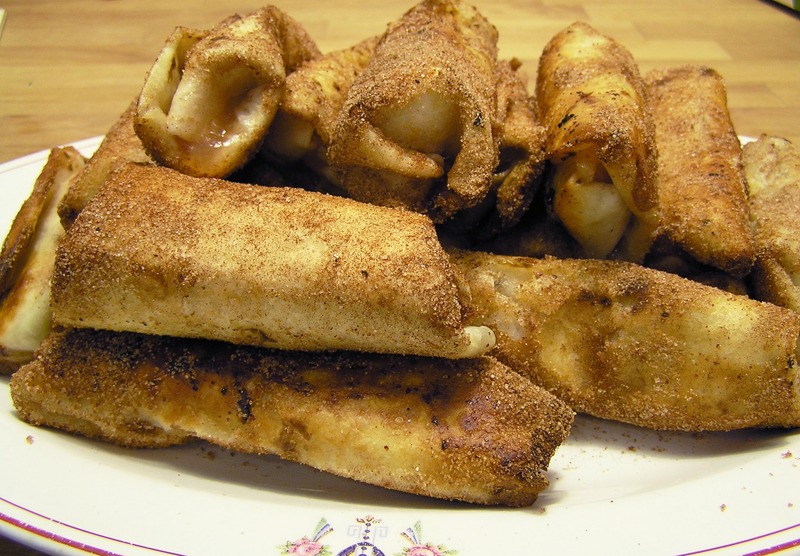 Just a note, the original recipe said this will make 8 to 10 Chimichangas using small flour tortillas. We ended up with 17 of them! Either our apples were really big or our tortillas were really small, or maybe both. I’m going to try to freeze some or take some to work for my office mates, if my daughter and husband don’t polish them all off soon. 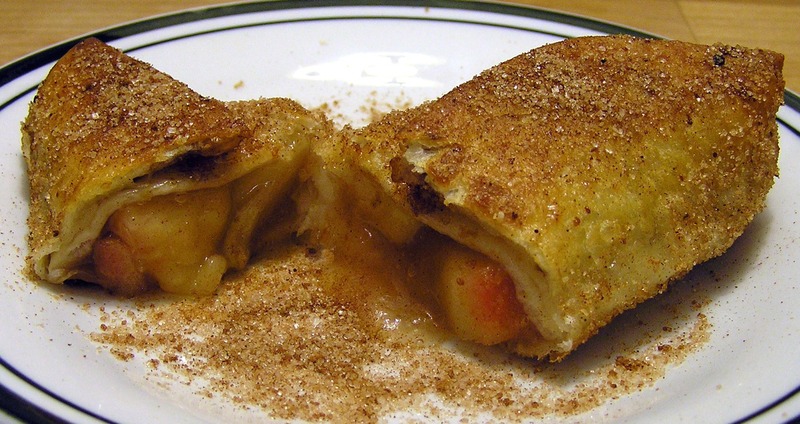 In a large skillet or saucepan, mix the all the filling ingredients except the apples and bring to a boil. Cook for about 3 to 5 minutes until the mixture becomes really thick. 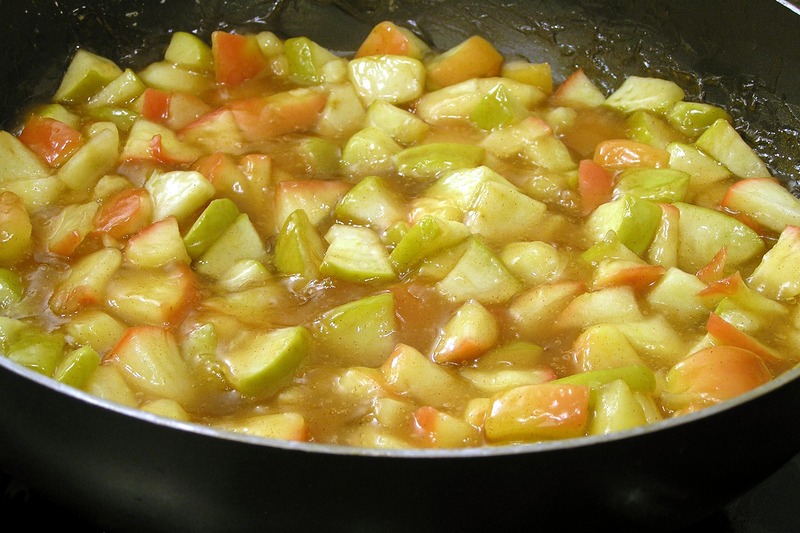 Add the chopped apples, cover, and reduce to a simmer, stirring occasionally until the apples are tender. The original recipe called for 10 minutes or so, but ours took closer to 20 minutes. I’m sure that was due to our high altitude. We also had to add an extra half cup of water to the mixture partway through to compensate for the longer cooking time. 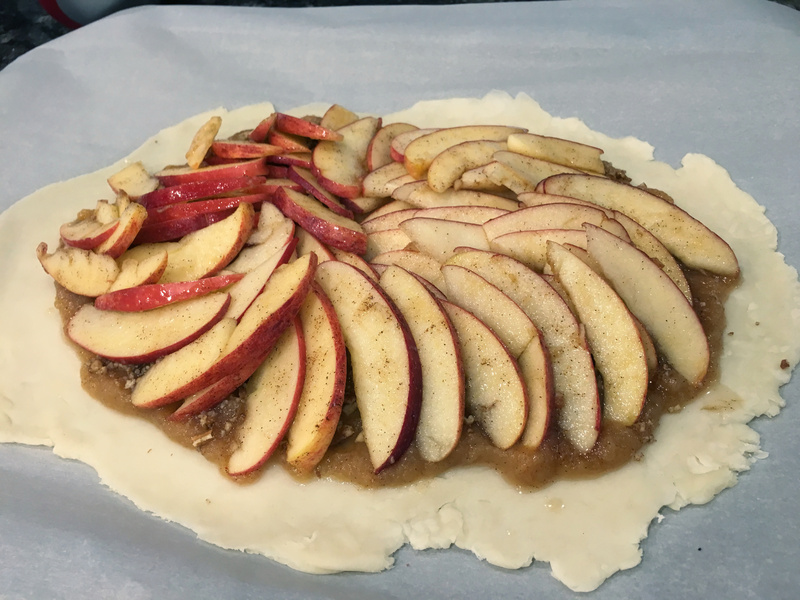 Once the apples are tender, set the mixture aside until cool. At this point dinner was ready so we let it sit through dinner and that clean up, which was about a half hour. First assemble your Chimichangas by spooning some filling in the top third half of the tortilla. I’m laughing now because that’s how I taught my daughter to do it, and the original instructions say the bottom half. I wonder if it’s easier the other way? I don’t know, that was just how I instinctively did it. 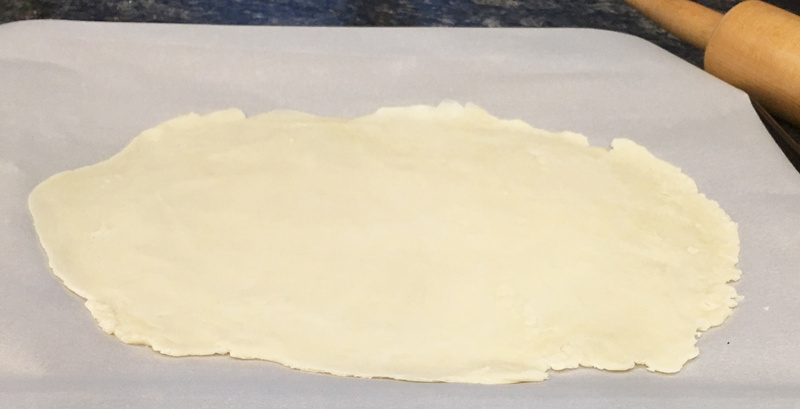 Anyways, flip in the sides of the tortilla partway over the filling then start rolling top-down, making sure the sides stay tucked in. This part was one of our issues, as daughter had a hard time keeping the sides tucked in as she rolled. I do think a majority of our splatter mess was due to the filling leaking out. Once they are all assembled, now add the rest of the sugar and cinnamon to a wide bowl or plate and mix up, then set aside. Next, add about a quarter inch of oil for frying in a large heavy bottomed or deep cast iron skillet. We used plain vegetable oil. Heat it until medium-hot. (I don’t use a temperature gauge, I use the old-fashioned trick of sticking the tip of a wooden chopstick to the bottom of the pan. If it sizzles and bubbles right off the bat from the bottom, then it’s ready.) Using tongs, lower two to four Chimichangas into the hot oil one at a time. My daughter could only handle frying two each batch as the splatters freaked her out, so that took us a bit longer too. We did use a splatter screen! Let them fry for maybe 30 seconds per side (really!) then move them off to drain on a paper towel once golden brown. Some were done more than less than others but don’t fret, it’s all good. Don’t let them sit too long or the sugar coating won’t stick! Roll each one around in the cinnmamon sugar mix while still moist, then put on another plate while you fry and coat the rest. 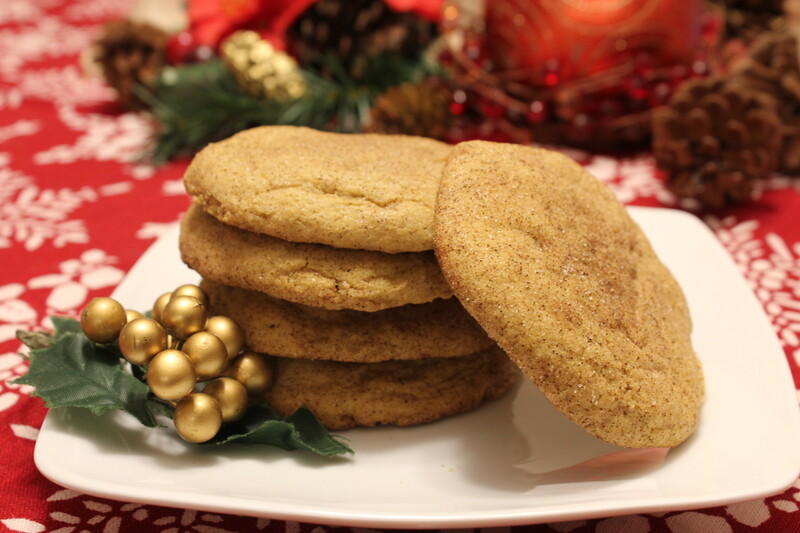 Once done, feel free to sprinkle more cinnamon sugar over the top, and do eat them while warm! I will have to experiment on the best way to warm them up. Toaster oven? Microwave? Not sure yet as of this writing. I hope you have a chance to enjoy this dessert, as I don’t post many at all here. I’m a savory kind of gal, but one of these really hit the spot after dinner! And if you think flour tortillas would not be crispy or too floury tasting for this, well you have another think coming. I was amazed!